Why Wait for Hunted Chapter Two When You Can Have It in Your Ears Now? If you are anxiously awaiting the March 10 release of the latest installment, Hunted, in the House of Night series by P. C. Cast and Kristin Cast–and let’s face it; who isn’t?–then you won’t be able to resist this new opportunity. If you saw our blog a couple of weeks ago, you know that the House of Night website posted the first chapter online. Well now they’ve done that one better. They have a podcast of chapter two. You can go to the website and listen to the second chapter right now. It’s actually a good reader! Why wait until March 10? If you haven’t read the first books, stop by The Unquiet Library today to check out Marked, Betrayed, Chose, and Untamed. We just got in a new shipment this week with new copies of all four books. Hunted should be coming in soon! Can’t wait! Can’t Wait Until March 10 to Read Hunted? Get Chapter One Now! 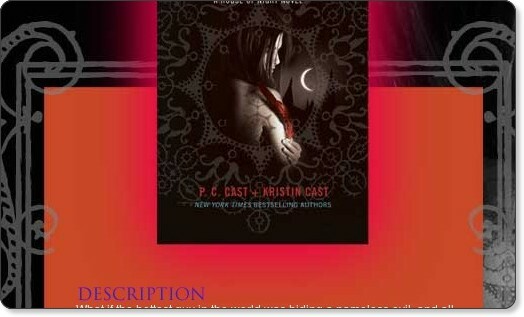 Are you a fan of the House of Night series by P. C. Cast and Kristin Cast? Well, if you are, then you know that the next installment in the series, Hunted, goes on sale March 10. Can’t wait? Then mosey on over to the House of Night website to read the first chapter online. But be warned, it’s addictive. After you read the first chapter, you’ll be driving yourself crazy hanging out at the bookstore begging the nice salespeople to sell you an advance copy of Hunted before it goes on sale. In the meantime, if you’re not familiar with the series, our library has the first four books, Marked, Betrayed, Chosen, and Untamed available for checkout. When someone else isn’t devouring them, that is. You can also check out P. C.’s blog for more info. Happy Reading!